Chennai: Towering Tamil Nadu politician Muthuvel Karunanidhi breathed his last on Tuesday, August 7, in Chennai after battling ill health for weeks. He was 94. Doctors at the Kauvery Hospital kept the leader on maximum medical support but his health continued to decline. 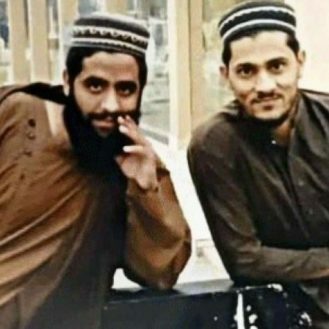 It was becoming a challenge to keep his vital organs functioning, doctors had said on Monday. “With deep anguish we announce the demise of our beloved Kalaignar M Karunanidhi on 07.08.2018 at 6.10 pm. Despite the best possible efforts by our team of doctors and nurses to resuscitate him, he failed to respond. We profoundly mourn the loss of one of the tallest leaders of India and we share the grief of family members and fellow Tamilians worldwide,” a press release by Dr Aravindan Selvaraj, Executive Director of Kauvery Hospital, said. Fans and supporters of the five-time chief minister kept a strict vigil outside the hospital, praying for his recovery. Chants of ‘Ezhundhu Vaa Thalaivaa’ (Awake, our leader) and ‘Vaa, Vaa, Gopalapuram Polaam Vaa’ (Come, Come, let’s go to Gopalapuram) could be heard outside the hospital. The DMK patriarch was admitted to Kauvery hospital following a drop in blood pressure on July 28. Since then, the medical status of the 94-year-old has gone through ups and downs. 9:40 pm: National flag to fly at half mast tomorrow in Delhi and all state capitals as well as throughout the state of Tamil Nadu. It has also been decided to accord state funeral tomorrow in Chennai and national mourning has been declared for tomorrow: Government. 9:20 pm: Madras High Court acting Chief Justice Huluvadi G. Ramesh agrees to hear by 10:30 pm today a case against denial of burial land by Tamil Nadu Govt at Marina beach for M Karunanidhi. 9:15 pm: Karnataka Government has declared one day state mourning on Wednesday. 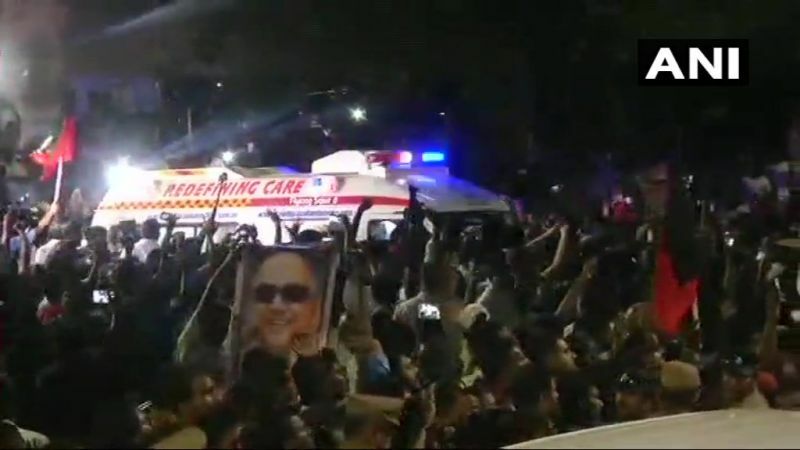 9:05 pm: Ambulance carrying Karunanidhi’s mortal remains leaves from Kauvery Hospital for his Gopalapuram residence. 8:50 pm: DMK workers protest outside Kauvery hospital after Tamil Nadu Govt denied land for Karunanidhi’s Anna memorial at Marina beach. 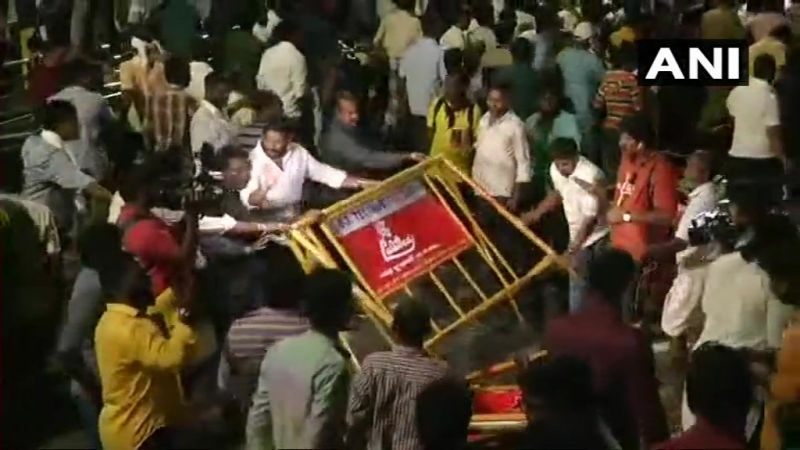 8:30 pm: Tamil Nadu government denies permission to bury DMK president M Karunanidhi near the Anna Memorial at Marina beach, reported news agency ANI. 8:14 pm: Tamil Nadu Government declares public holiday on Wednesday and seven-day mourning. 8:07 pm: “He had shown the path to regional parties, its a tragic moment for his workers and those who loved him. He was a mature leader and a statesman. Pray to almighty that his soul rests in peace,” says HD Deve Gowda. 8:05 pm: Congress President Rahul Gandhi along with senior party leaders Ghulam Nabi Azad and Mukul Wasnik to travel to Chennai tomorrow. 8:00 pm: M K Stalin in a statement has appealed to DMK workers to maintain peace and discipline, thanks doctors and the management of Kauvery Hospital. 7:45 pm: PM Narendra Modi to travel to Chennai on Wednesday morning, to pay his last respects to the DMK chief. 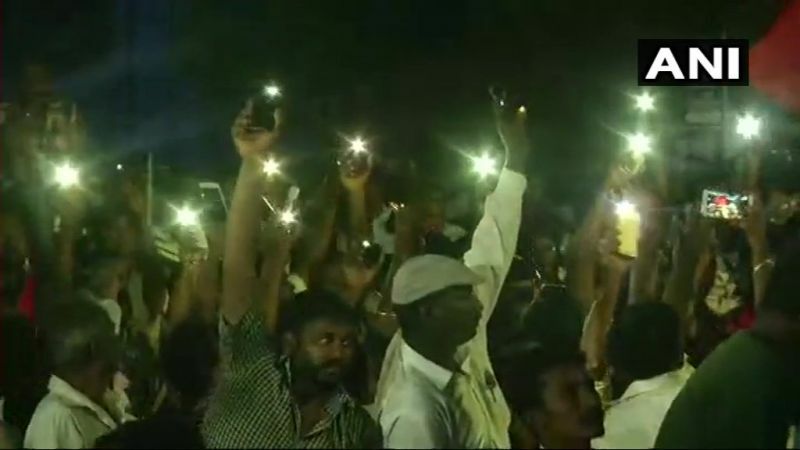 7:35 pm: DMK workers gather outside Kauvery hospital, raise slogans in memory of Karunanidhi. 7:30 pm: In a statement, Telangana CM KC Rao expressed his condolences to the bereaved members of the family: In his death, India has lost a political stalwart and it will be difficult to fill the void caused by his sad demise. June 3, 1924: Born in Thirukkuvalai near Tiruvarur, composite Thanjavur district. August 10, 1942: As self-styled leader of ‘Tamil Nadu Tamil Maanavar Mandram’, launches ‘Murasoli’ in Tamil as handwritten manuscript. September 17, 1949: Among the ‘Founding members’ of the DMK at the rally at Robinson Park in old North Madras, where DMK was launched. July 1953: Arrested for the ‘Kallakudi Agitation’, demanding renaming of Dalmiyapuram railway station as part of the anti-Hindi agitation, along with poet Kannadasan and others; Karunanidhi was convicted for six months for that stir. February 1954: Returns to Chennai to a hero’s welcome at Egmore station. April 1957: Elected for first time to the Madras (later Tamil Nadu) Legislative Assembly from Kulittalai constituency near Tiruchy; Noted for his anti-Zamindari campaign there in the run-up to the Assembly polls that year. 1959: DMK founder C N Annadurai honours Karunanidhi for steering DMK to victory in Madras Corporation elections. 1961: Karunanidhi made DMK Treasurer. 1962: Deputy leader of the Opposition in the Assembly on election from Thanjavur constituency. March 1967: PWD Minister in Annadurai-led first DMK Ministry, after elected from Saidapet Assembly constituency in Chennai that year. July 27, 1969: Elected as President of DMK, a post he held till the end. 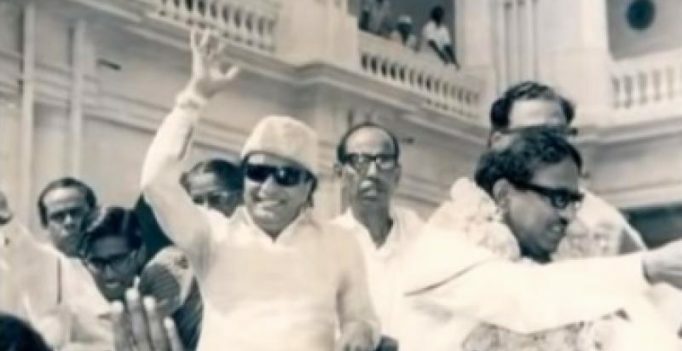 January 27, 1989: Comes back as CM for third time after MGR’s demise. June 1991: Quits Harbour Assembly seat, owning moral responsibility for DMK’s defeat in the General elections that year. May 13, 1996: Assumes office as CM for fourth time after leading DMK to a massive win in alliance with G.K. Moopanar-led Tamil Maanila Congress. December 31, 1999- January 1, 2000: Presides over unveiling of the massive 133-feet tall statue of saint-poet Thiruvalluvar at Kanyakumari. May 13, 2006: Sworn in chief minister for fifth time, elected from Chepauk constituency in Chennai. February 12, 2009: Undergoes major spinal surgery that confined him permanently to a wheel-chair; missed the Republic Day Parade for the first time that year in his long over eight-decades-long public life. April 28, 2009: Goes on a sudden, indefinite fast at Anna Square on the Marina in Chennai to press the Sri Lankan government to announce a ceasefire in its war against the Tamil militants in the Island’s North. August 10, 2017: Steered by his son M K Stalin, Karunanidhi visits ‘Murasoli’ office in Chennai on occasion of its ‘Pavazha Vizha’, a rare visit outside his Gopalapuram house where he stayed put since his second bout of illness in October 2016.